Guys! I did it! I finally pulled the sunroom together, and I think it looks pretty awesome! After living in our house for four years it finally feels like we are starting to put our stamp on the spaces in our home. The sunroom was the latest such adventure. Decorating a home is a very slow process, though super rewarding and satisfying. Much of the first four years have been spent putting things together and giving the home a vibe that read ‘us’. We’ve spent a little money, but overall have been pretty frugal when it comes to decorating. The bulk of our money has been spent on projects that had a big pay off, like painting the house. Now it feels like we are entering the next stage of living in a home (the second layer, if you will) where we can start to dig into the details of each space to make sure it truly represents us aesthetically, consistently and cohesively. We’ve been able to really get used to our spaces over the years. We know how they currently function and how we would like them to actually function. Some spaces still need improving and tweaking. Our bedroom for example, still consists of college furniture and a mattress on a bed frame – it looks ‘pretty’ but still needs a lot of work. We are now ready to dive in a little deeper and begin to make rooms functional and decorate them with purpose. 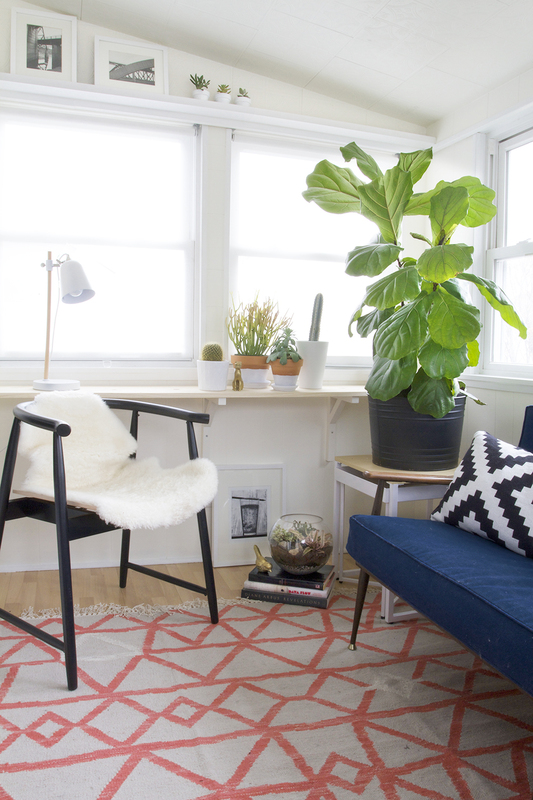 I’m excited to be able to start focusing our decor dollars, and I think the sunroom makeover are the beginnings steps of addressing that second layer – four years deep. Our porch wasn’t bad before, it really wasn’t. I thought it was cute and cozy, but it still didn’t function very well and because of that we barely used it. It’s a really good example of that first layer of decorating — pulling random furniture together with a few repeating design elements to try and make a cohesive look. Although it photographs nicely, it didn’t feel as comfortable in real life and because of that we rarely used this potentially super cool room. 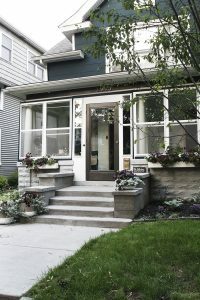 These are the limitations a lot of people encounter when trying to furnish and pull together a home; most of us are not made of money and these compromises have to be made. The sofa was re-covered in an old curtain that I attached using pins. I know, that is a dumb idea, but I was grasping for a solution that didn’t cost an arm and a leg. As a result of this pinned approach, the kids wouldn’t go anywhere near the sofa for fear of getting poked. The cushions were constantly slipping off it as well. The rug had been floating around with us for the last eight years or so and was a green dusty mess on the verge of falling apart. The vintage end table/turntable was cool, but was constantly shorting out and shocking us. 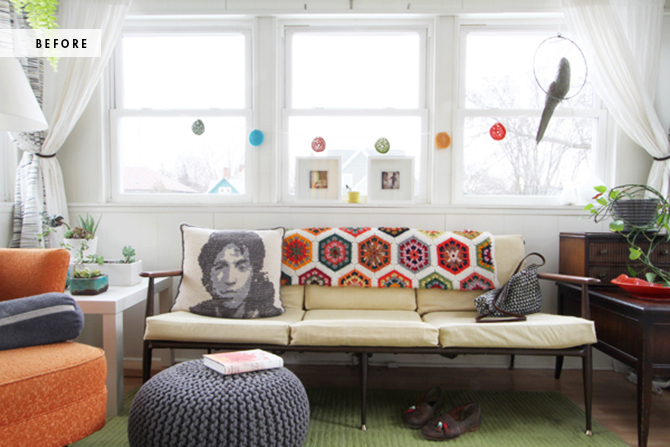 We tied the room together with vintage crocheted items which, although cute, didn’t really reflect us or our style. That’s another thing. I think my tastes are changing a bit. I used to be so dedicated to mid-century furniture pieces, kitschy vintage stuff, and bright pops of saturated color. After experimenting with my interior style for years I think I can finally begin to define it with a few simple elements. 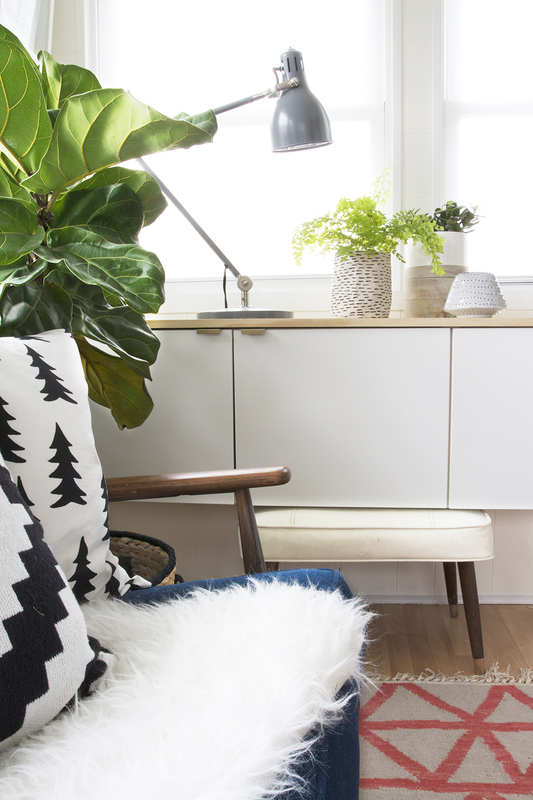 Neutral backgrounds, black and white graphic accents, a combination of mid-century and modern furniture pieces accented by a few well-curated vintage favorites. Also, I love almost any shade of blue (even though green is my favorite color), brass is always good, and coral and yellow accents get me every time. Oh, and please don’t forget the plants. It’s weird how these transitions happen. I feel like all of the apartments and rental houses that I have lived in and decorated have just been practice for this house, and somehow even this house is still practice for this house. 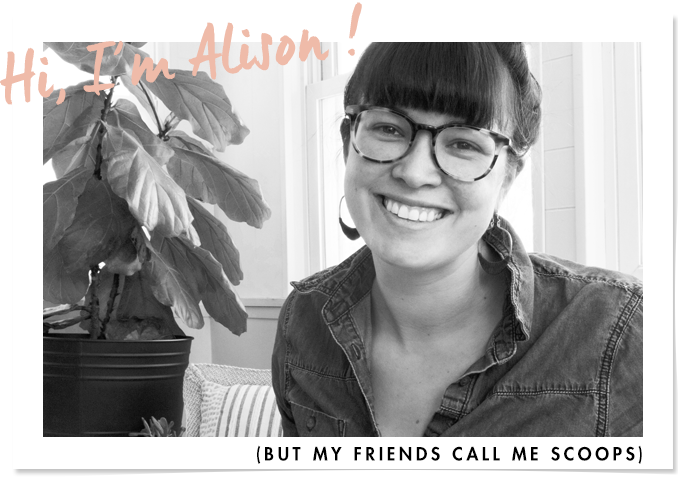 I guess I am realizing that my design sensibilities are always changing, as they should, I suppose – I guess that means endless makeovers, right? 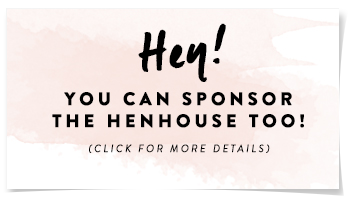 I think between the kitchen makeover earlier this fall and the new sunroom look, I have finally found a style that really just feels like us, and I am excited to see where this new awareness takes me throughout the rest of the house. Enough with me blabbing, let me show you guys the rest of this room. I’ve mentioned to you before that the room is pretty small, approximately 7 x 11 feet. The floor slopes down, as sometime over the last 100 years this space was an open air porch. Trying to lay out furniture in a room with a sloping floor is really tough, especially when the windows are all square. I mean, I’m glad the windows are square and level but it just gives the eye something to compare the sloping floor to constantly. It could drive an obsessive person like myself almost crazy. My solution was to position the sofa on the level side of the porch, and then add shallow shelves and a “fauxdenza” on the perpendicular sloping walls under the windows to create a level space for my eye (and my cocktails) to rest. Functionality is key in a small space, and the shelves and fauxdenza allow us space to set our plants, a television and a couple of lamps. Plus it lets us store stuff in the cabinets. Adding these shelves was the solution. There was no other way to do this and I’m glad after four years I finally figured it out. The shallow shelving is just deep enough to use as a workspace. I have fallen so in love with this room, I plan on working and blogging from here in the future. It’s peaceful, bright and inspiring and my new favorite place in the house. I would be crazy not to hang out in this porch all of the time, see ya later kids. My friend Nicole had the fantastic idea of adding pre-fab ledges above the windows on these sloping walls as well. This was such a great solution because it covered up some damage that had happened to the embossed tiles due to some bad curtain rod installation (not my fault). I caulked the ledges and painting them and they look almost built-in to the space now. Caulk, you guys (that’s what she said). I got comfortable with using it when I was fixing up the kitchen, and now I want to caulk everything. This room was riddled with gaps between the windows and trim, the clap boards, and the panelling. What would this room be without caulk? Caulk is just another dimension of the second layer of homeownership. I must caulk all things, trim, windows, bathrooms, everything! It will be caulked, oh yes, it will be caulked. Ha. 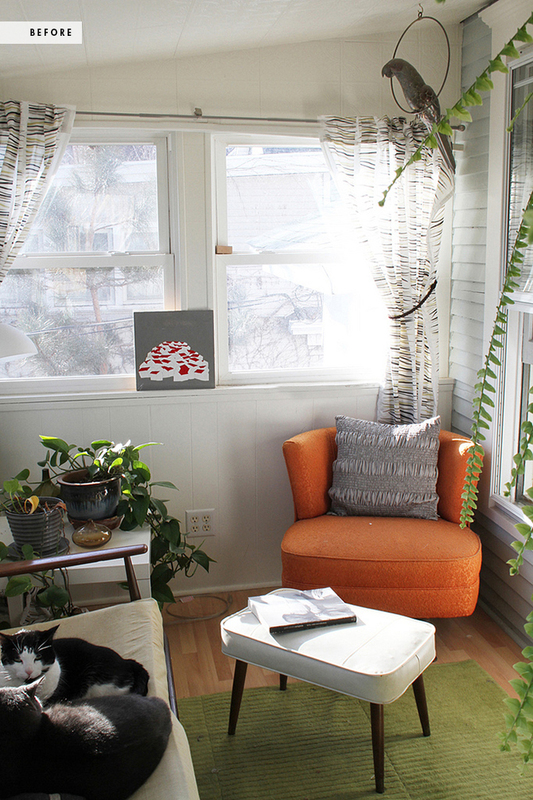 On both the ends of the porch I installed simple Enje roller shades from Ikea. I love the way they diffuse the light and block out the neighbors. You might have noticed my new bit of motivational artwork with the eff bomb in it too. After all the stress and anxiety over the last weeks, this highly inspirational phrase has become my new motto. 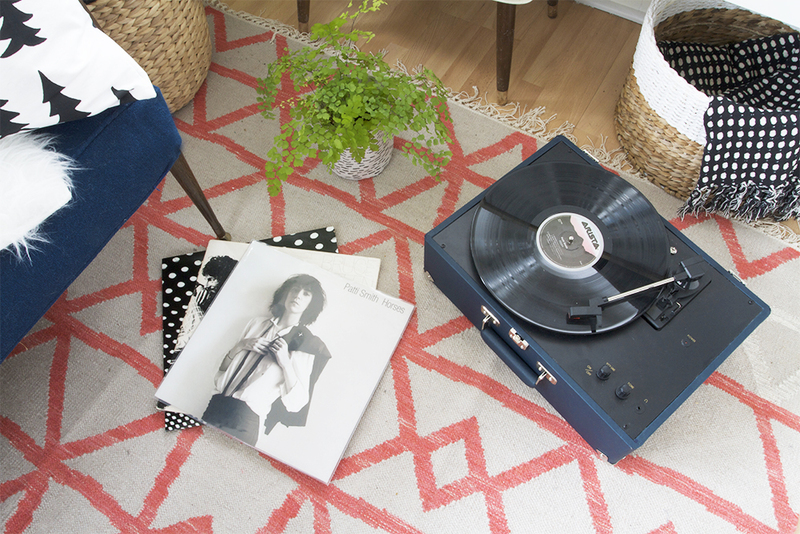 Very crucial to the vibe of sunroom. Awh, there it is! That pretty little fauxdenza that I love so much. If you aren’t familiar with the concept of the fauxdenza, it’s basically taking a set of Ikea kitchen cabinets, floating them 6 – 12 inches off the ground and adding some sort of top to make it feel like a floating credenza. Genius. What bettter solution for furniture in a sloping room then a fauxdenza? I love it so GD much. I didn’t get fancy with a top, just a simple piece of pine board. The pulls are standard Ikea pulls spray painted gold to compliment the other brass bits spread throughout the room. The pulls weren’t a big investment, so if I fall out of love with brass or faux brass (as it were) down the road it will be easy to swap out. In planning the space I did something that I don’t normally do. I began brainstorming what I wanted this room to be and even created a word cloud. Yes that’s right, a mother effing word cloud. Wow, me, you are so old and boring! It had been on my to-do list forever to be brave and reupholster the sofa by myself. I knew I had to do that. I couldn’t let myself down. It was a goal, dammit. What I didn’t know was how the rest of the room would fall into place, thus the need for the word cloud to bring some clarity to the planning process. No matter how totally nerdy it is, I do think the motivational brainstorming helped me focus on a vision. After paging through my notebooks the other day I came across said list, which is below. At least it doesn’t include lame emotional words like “luxuriating” or something. It’s more practical than that, which is cool and not lame…right? I replaced the flush-mounted ceiling fixture with this beauty from Ikea. I wasn’t convinced at first, but the price was right and it grew on me over time. Sometimes it seems like compromises have to be made when spiffing up old homes. 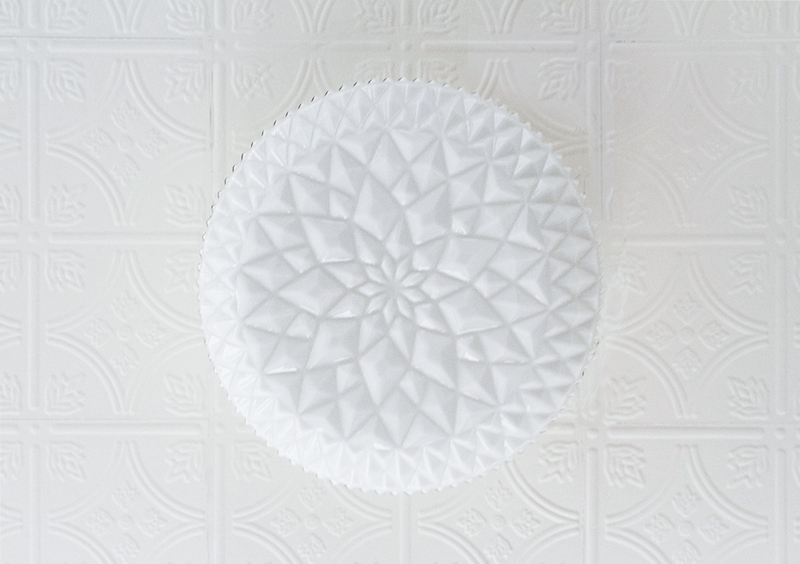 No one makes beautiful low profile, inexpensive, flush mounted ceiling fixtures for not-so-tall spaces. Ikea had something that seemed like it would work, but I wasn’t sure of the look. I took a chance, installed it, and now I kinda love it a little bit. The rug is, by far, the thing that I didn’t expect from this room. It is definitely not mentioned in the cool word cloud. As I began my decor journey (yes, it was a journey) I spent a lot of time in the space, listening to the room, and getting a vibe for what it wanted to be, man. It was coming together but it needed something. I had been crushing on navy and coral for awhile and thought that might just be the thing, but I didn’t know how to incorporate it. Adding a coral pillow to the navy sofa seemed obvious, but felt like it would be too much of one color in one specific place. A pretty coral pillow on the side chair may have worked, but I couldn’t find anything that I loved. Then by chance I saw this rug. Maybe it is a little crazy to put an intensely patterned coral pink rug on the floor in my porch, but I really like it. And that’s just the way it is, guys. Also, we got a new portable turntable! Okay, so maybe my audiophile dad might not approve of this overly expensive, cheaply-made little guy, but it suits us just fine and we can move it easily between the front porch and the sunroom. The turntable comes in navy, duh, you guys, just duh. This whole room started with a sofa that needed badly to be reupholstered. I don’t know why I was so timid about rising to the reupholstery challenge, but I was. Sewing machines irrationally scare me, but I got a bit of courage, had a few of you friends give me some sage advice and I went ahead and took on sewing two long box cushions in thick navy upholstery fabric. Now look at where this little adventure has taken me – I have a whole new room that I love so much because I took a risk. When did I get so sappy, you guys? Anyway, it’s just another thing that will make me love this house more and more. I can’t mention it enough, (because then I would sound so uncool) but this has been such a rewarding trip for me. In preparing for this post I became curious about the brass and copper parrot I’ve been toting around for the last eight years or so. It was given as a somewhat ironic birthday gift (hey it was the early oughts, irony was abound) from a friend. I always liked it, so I kept it around. I started googling brass parrots and quickly learned that this little guy is not an ironic thrift store find given to girls on their 24th birthday, but instead a piece by Mexican artist Sergio Bustamante, and it’s valued at a G or two. It’s like Antiques Road Show all up in here. Thanks for the cool gift, old friends, you know who you are. The sunroom looks great and the progression really shows your changing tastes. I feel you on the style shift. I used to be enamored of mid-century everything and now I appreciate antiques much more. I think the best houses- and the ones that look good the longest- are a mix of styles. Some clean lined antique or vintage pieces really work with mid-century or West Elm contemporary style furniture. I have also changed up on on colors. I liked the mid-century orange for decor, but that has never been a color I favored in real life- I actually wear blue, tan, olive, and grey… and my house now becoming those colors. I will still always love mid-century and bright and think it is cute and fun, but it might be a look that suited to a particular season in your life. Thanks, lady! I totally agree with you. Isn’t that funny how our homes so often reflect what we wear? I too, still love mid century stuff, just not everything has to be be mid-century all the time, you feel me dawg? It looks so cozy in there! 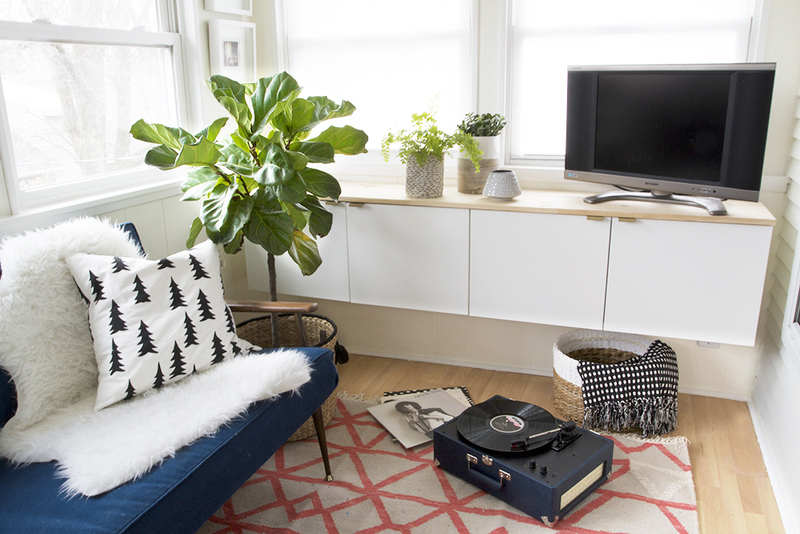 May I ask where that cool 2-piece, nesting-ish, side table from? Oh yeah, duh. I knew I would forget something on the list. 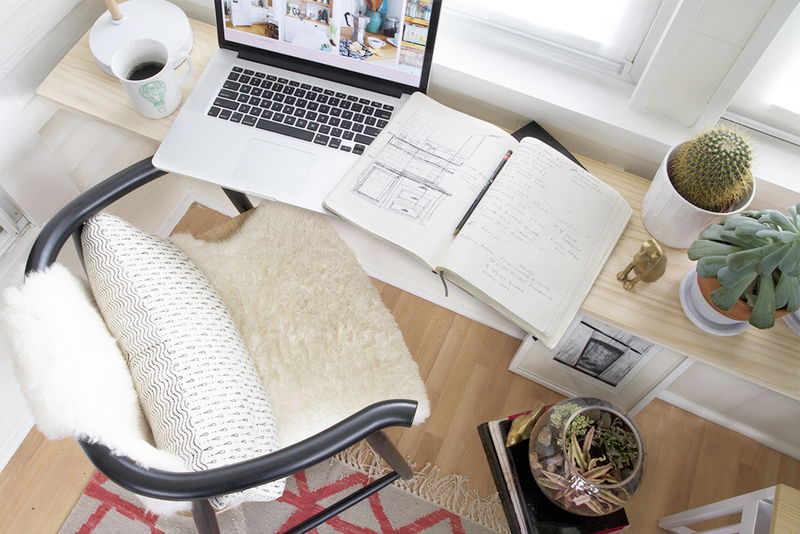 The nesting table is from Target, and you can find it over here. The sunroom looks super rad. I wish I had a space like this, but alas, tiny apartment is tiny. What I want to know is, do your cats not spend half the day chomping on all of your plants? Hey, Katrina! Thank you! We only have the one cat nowadays, and she has no interest in eating plants, never has thankfully. Do your cats eat your plants? Not cool, cats! They do, and one of them is very dedicated. He has pulled plants off of shelves I thought were unreachable. What a jerk. Way to have an awesome, non-plant-eating cat! It looks flippin’ fantastic! It always cracks me up that we don’t know eachother in “real life”, but seem to be working on something extremely similar! I’m just waiting for my husband to install the floating desk and shelves before I can decorate our newly remodeled sunroom!! We did purchase many of the same things…I can’t wait to put the space together! I hope it looks 1/2 as great as yours! Thanks, Elizabeth! I know it is weird knowing people on the internet and feeling connected – but not all the way. I hope that you guys feel like you know me a little, I feel like I know some of you too! I’m sure I would totally be real life friends with so many of you. Hey, Jennifer! Things really do take awhile! For me, I feel it helps to take the time and make good judgement calls – decorate the way you really want, not just for the moment, you know? You should try some cacti, they aren’t too hard to keep alive. Even if they start to die, they still look like they are living. The space looks wonderful! I like your comment about how you’ve been in your house for four years and just now things are starting to really feel like “you”. That’s so encouraging to me. My husband and I have been in our house 2 years and I feel like so much of the place isn’t “me” or “us” yet! One project at a time! Robyn, It will get there! It does take a lot of time doesn’t it? As we live in this house I am starting to see bigger more daunting projects all the time, the popcorn ceilings are one. It’s one of those things you can avoid for awhile and then someday, after you doing everything else, you have to face facts and take care of it. Good luck to you and enjoy the ride! Holy crud, this room looks amazing! You make me want a space like this! It did inspire me to re-arrange the bedroom to give us a nice reading corner. Work with what you have! As for changing tastes, I have come to realize I used to decorate in a modern formal style and I’m not entirely sure why. Last fall I was introduced to the magic that is Emily Henderson (SO late to the party) and it changed everything for me. All the weird crap we have collected (trinkets, art, fabrics – you name it!) is now front and center and the house is finally starting to look and feel like us. When we can finally paint (we currently rent, but are jumping through all the slow hoops required to buy this place), it’s going to get real. Hey Stacey! Yeah, work with what you have is my motto! Emily is so great, isn’t she. I still love watching back episodes of Secrets from a Stylist – I always find new inspiration there. I love the concept of putting your favorite things out there, what’s a home if your favorite stuff isn’t featured front and center. So exciting about maybe, kinda house-hunting. Good luck! And oh, caulk! It’s like that thing you’re always missing and then once you have it you’re all like- thats it- eureka! Makes everyone look so darn professional. And I totally love your word cloud. It can rain on me anyday! I’m sorry. I’ve had coffee. Awh, Caroline! You are so complimentary all the time, thank you for the boost! You are a nice e-friend to have :) Yes caulk, it’s the greatest – it’s messy, but you’re right it makes you feel like a real pro. I positively adore this transformation! 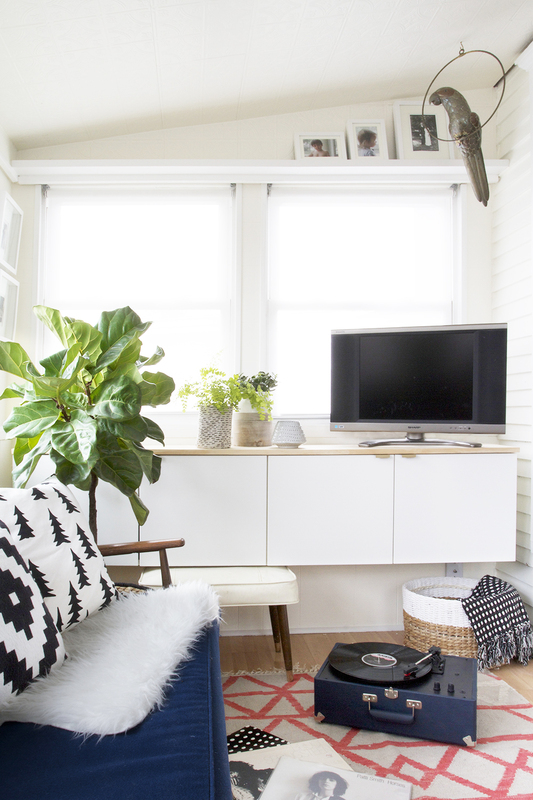 Loving the colors and graphic patterns, and I really like the fauxdenza and shelf workspace. You inspired me to add some more plants to my office too! 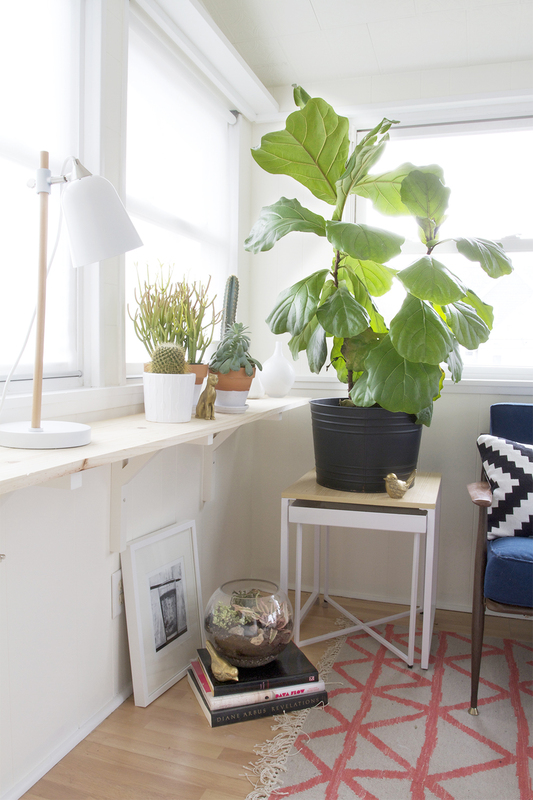 And I love those white Ikea pots like what your cactus is in. I put mini poinsettias in several this year and lined them up on my dining room table. They look great with everything! Excellent usage of Day light!!! Using day light is not about bringing it in, its about using it as you did with flowers and small plants.. I love it!! it´s fabulous!!!!!! and very inspiring!! I really like the shallow shelving and maybe it ´ll be a solution for a space in my own home that it might work! great job and again it is really an inspiration and great to see your evolution! Thank you so much, Natalia! 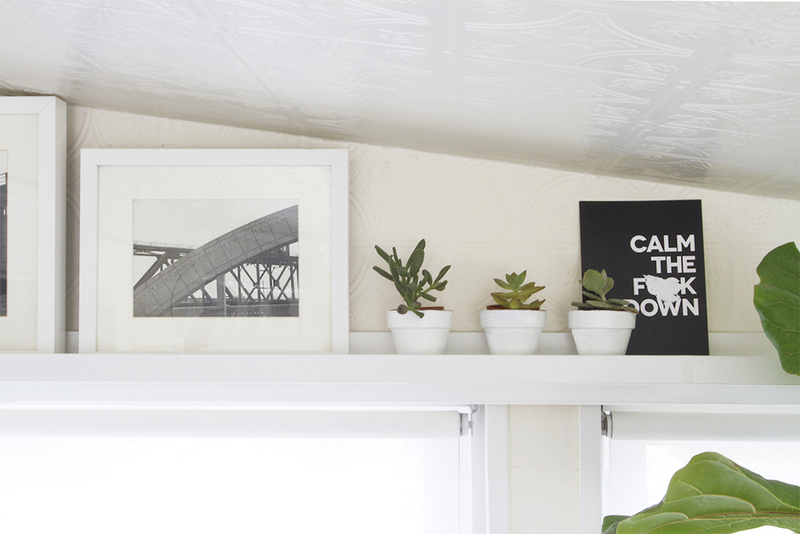 I say go for the shelving – in my book it always comes in handy when you are limited on space. There’s like 80 things I love about this. 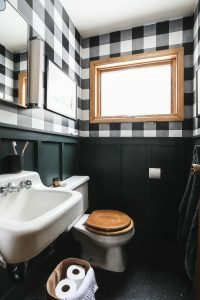 I love that you are also a huge fan of caulking (I mean, there’s no way to talk about it without sounding dirty no matter how straight I try to keep my face), but seriously, I just used caulk for the first time like a month ago when we redid our bathroom, and now I want to caulk everything. Everything. Also, I love that it is also taking you years to find your style for this house. Sometimes I feel like a huge failure because I’ve lived in my house for almost 4 years and we’re constantly changing our minds and readjusting — and there are several rooms we haven’t even started. But then again, if I had it all done in 6 weeks, I’d have nothing to blog about now! Ok, I won’t go into detail on the other 78+ things I love, but just, great job! Scoops! The parrot is worth a couple Gs?!? Incredz. Where is it now, in the dudes’ room or straight to eBay? How are you finding the rug cleaning wise now after having it for a few weeks? Super easy! Granted this is probably one of the least busy rooms in the house. I think I’ve only had to vacuum twice and there is no new-rug-shedding. it all looks amazing!!! 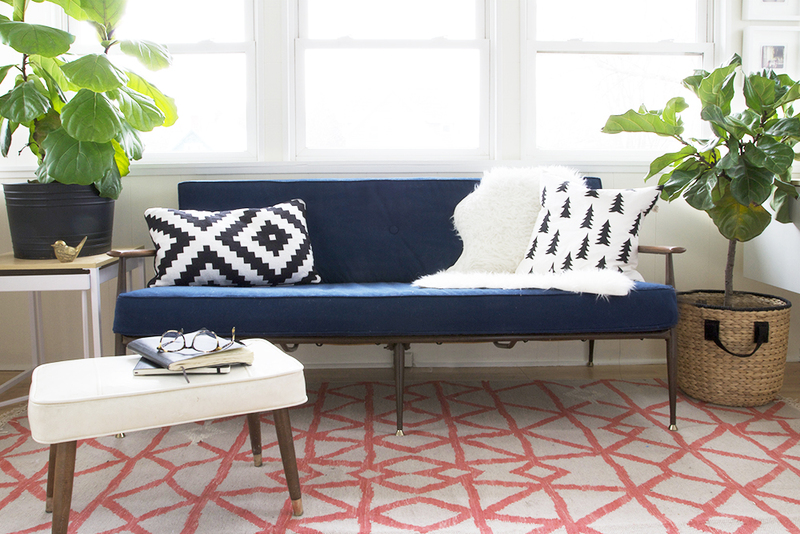 Do you mind sharing how you reupholstered the couch, and what you used for filler? Thanks! Hey Sally! Thanks! I did a post on the reupholstery here, and I got the Medium weight foam at Rochford Supply. Hope that helps. The sunroom looks awesome! I really love the floating furniture. How do you use your TV? I think I see a cable jack under the cabinet, but I assume you had to install that? I get so nervous cutting holes in old walls to install “new” technology that I’m not sure I would ever be able to take the step to do that. Hey Jilly! We actually cut the cable cord about a year ago. We changed to a local internet provider and are strictly plugged into the outer world via our rokus (netflix, amazon, pbs) and our chromecast (HBO). My husband needed to be able to watch sports for his side job, so we have cable downstairs on one TV, but we never even turn it on. The best thing about switching to these types of devices for your tv media access is that they are all connected to your network wirelessly thus resulting in minimal cords! What size are the cabinets you used for the fauxdenza? Sorry for the delay in response. 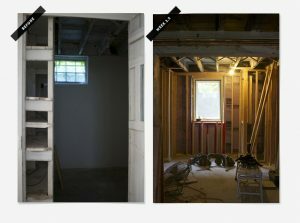 I used two 30 x 12 inch cabinets wall cabinets. Hope that helps. 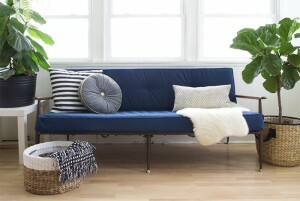 Just found your blog and love the mid-century style. I’ve been doing a lot of research on dining chairs and loved the black one in your sunroom. Where did you find it? The interior looks so amazing. Are the plants real? we will definitely try this in our upcoming Apartments in Trivandrum projects. We would like to try sun room in builders in Trivandrum. Nice designing. Perfect changeover and many Builders in Thrissur do these methods in their Apartments. Good design.Sunlight is a key factor for any Flats for sale in Thrissur, so making a sun room is must. Flats for sale in Thrissur is adopting sun room ideas. The sunroom looks super cool. Good work. Cool pictures. Really refreshing style of designs. Thank you. Hi-Life Builders, the most trusted name among the well reputed home makers in the land of Poorams, Thrissur, Kerala. Today it is large enough to be counted amongst the foremost real estate companies in Kerala, but in essence it is small enough to address each customer personalized needs and expectations. Nice information. Thanks for sharing with us.This is helpful for who are searching for new ideas in their apartments. well!! !.this is an amazing post.am freelance blogger.thanks for sharing with us.the heart of Calicut,the landmark builders build luxury and trending flats ,villas and apartments for you.they have 20 year experience in this field.the one of the leading builders in Kerala. The customer satisfaction is an our main mission.we want to try know their mind and build their dream property.more details visit us.